Hello, everyone! I recently bought the ‘Drops of Light liquid peel’ from The Body Shop after reading rave reviews about the product and I particularly wanted to try it out to take care of the hint of dullness that I noticed about my skin. Our skin gets exposed to sun rays and pollution, which causes skin damage. Apart from these external factors, improper cleansing also leads to the formation of dead skin cells on the surface of the skin. Being a makeup artist, I often wear a lot of makeup. Though I remove my makeup at the end of the day, I’m not always sure if my face is squeaky clean. I’m sure that this is a common concern. This is where an Exfoliator comes in. An Exfoliator scrubs the surface of the skin, which will remove any dirt or makeup that is clogging the pores. It plays a vital role in removing the dead skin cells. 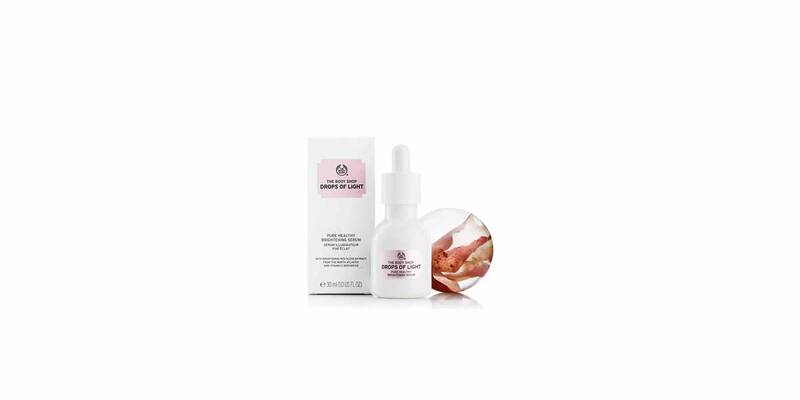 The Body Shop Drops of Light liquid peel is a get-to-peel technology that claims to peel off impurities and unveil healthy looking skin. The main reason I was looking for a peel was to get rid of the tan marks on the forehead and the darkness around the mouth. On usage, this product visibly reduced the darkness and brightened my skin. This product has made it possible for me to maintain my skin without any visits to the beauty parlor for more than a month. I use this product twice a week. Take two pumps of the liquid peel and gently spread all over your face and neck area. Massage your skin in an upward motion. This product does not have any physical Exfoliators but you will notice the formation of tiny lumps as you massage. I stop at this point and voila! You are left with soft, supple and fresh skin in no time. Initially, to test the product, I used it for two consecutive days. On day 1. I used this peel and left my skin untouched for the rest of the day. On day 2, I used my favourite face wash from Elizabeth Arden before using the peel. To my surprise, it did not form any lumps as I had used the product the previous day to clear the dead skin cells. But, as usual, the product left my skin soft and bright. I found that all the claims and the praises about this product were true. I could immediately see a difference in my skin. It is not time consuming and very easy to use. It really does remove your dead skin cells. I also like the packaging. It comes with a pump which makes it easier for us to dispense the product without wasting any. I know that this product is here to stay in my skin care routine and I will definitely repurchase it. I will give this product a 9 on 10.